Although many shook their head at the 1 o'clock start time for this game when it was announced, it turns out it was fortuitous with the Seahawks playing at 5 PM. The game against USF is a bit of a crossroads game for the Pilots IMO. USF's record is not good (7-10/1-4), but they are a very good team, they have a talented coach that we all love to hate, and UP is dinged-up. We saw during the SCU game that KB has quite a ways to go before being an offensive force, Riley is down and still awaiting MRI results, and Bryce is doubtful for Saturday's game. The good news is everyone is stepping up and filling important roles, and Alec is finally finding a way to get to the free-throw line. Coach Walters has run many of his players off the Hilltop over the years, but he's replaced them with a number of JUCO players and transfers. Look for 6-7/230 Kruize Pinkins and 6-9/200 Mark Tollefsen to lead the charge both inside and behind the arc for USF. Just keep your DVR tuned to ROOT TV on Saturday: 1 PM USF @ UP; 3 PM PU @ USD; and 5 PM SCU @ GU. Please join me in yelling at Coach Walters to sit down!! After USF's last-second victories in the Chiles Center each of the past two seasons, I am REALLY looking forward to a Pilots' victory tomorrow. I'm sure the players are, too. This is indeed a crossroads game, as DD said. Even though USF is not off to a good start in conference, winning this game is a must for the Pilots if they want to contend for the top-4 in the conference. We cannot afford a let-down or a slip-up. It's time to prove that we belong among the league's upper echelon. NoPoNeighbor wrote: It's time to prove that we belong among the league's upper echelon. AMEN!!!!! We have underperformed for a few seasons now (yes, injuries were the case last year--but the bench provided little support, unlike this year). It is time for us to have some swagger and play like a top-4 team. Let's also not let the game come down to a situation where USF even has a chance to make it interesting in the closing minutes. I wasn't "above average" worried about this game yesterday... but without Barker (on top of no Pressley), I am a little more concerned; we will need Thomas and Voldy to play a lot of minutes. Lets hope USF is extra tired with the travel from GEG and quick turnaround. As classes begin again on Monday, there may be a few students and student/dance team members at the game....let's hope so. • The Pilots defeated Santa Clara on Thursday and now welcome San Francisco on Saturday at 1 p.m. Kids sixth grade and younger will receive free admission, while adult tickets start at $10. • Saturday is the WCC Game of the Week and will be televised locally on ROOT Sports with Barry Tompkins and Casey Jacobsen on the call. • The Dons (7-10, 1-4 WCC) have lost four straight after losing to No. 6 Gonzaga 88-57 in Spokane on Thursday. After opening the league with a road win at Pacific, the Dons have lost four straight. • San Francisco, picked to finish fourth in the WCC Preseason Poll, opened the league followed the Pacific win with losses at Saint Mary’s and at home to San Diego and BYU. • Forwards Kruize Pinkins (15.3) and Mark Tollefson (14.5) lead the Dons in scoring as the team averages 70.8 points per game. • Head coach Rex Walters is in his seventh season with the Dons and posts a 105-104 overall record. He led USF to the NIT last season after finishing tied for second in the WCC. • San Francisco swept the season series with the Pilots last year... USF stunned the Pilots to open league play after Chris Adams forced overtime with a buzzer-beating three-pointer... The Dons would win 87-81 and then complete the sweep with an 84-71 win in San Francisco. • Senior C Riley Barker suffered a season-ending knee injury early Thursday’s win against Santa Clara. • Senior G Kevin Bailey returned to the lineup on Thursday after missing the previous eight games with a foot injury suffered in the first half against Portland State on Dec. 3. He played 11 minutes off the bench. • Junior G Bryce Pressley suffered a concussion late in Saturday night’s loss against Gonzaga. He sat out on Thursday and is doubtful for Saturday. Disappointing but not surprising loss. Missing 2 of top 6 players, and a very aggressive USF defense made this a tough game. The coaches knew USF would shoot from 3P, but they not only did it, they did it from well behind the line, and they made a great percentage. Pilots shot OK from 3P, except for Bobby who had a tough outing. Alec also didn't score until late in the game; while the USF Fr. PG was their leading scorer and played very well. USF played so well that Rex didn't have any histrionics; DD never even got to yell at him to sit down. up7587 wrote: USF played so well that Rex didn't have any histrionics; DD never even got to yell at him to sit down. You're correct, UP was outplayed, Rex was under control, and I had nothing to say. This is the 5th year in a row the Dons have beaten UP in the Chiles Center....the absence of Riley and Bryce certainly didn't help the Pilots' cause, but USF was just lights-out in their 3 point shooting and, surprisingly, their free-throws. Coming into the game they were close to worst in the COUNTRY and they were 28/32 today. I was not only very impressed with USF on offense....there swarming, switching, and double-teaming defense was a big disruption to UP's offense, and USF was able to keep it up through liberal substitutions by Coach Walters even though he really only played 7 guys...all upperclassmen except the very talented freshman point guard, Devin Watson. Bottom line....USF was the better team, and UP was beaten pretty handily. PORTLAND, Ore. – The San Francisco Dons made 11-of-24 three-pointers to snap a four-game losing streak with an 89-77 win over the Portland Pilots Saturday afternoon at the Chiles Center. Portland senior guard Kevin Bailey scored a team-high 20 points, while freshman guard Devin Watson finished with 21 to lead the Dons. The Pilots (11-6, 2-3 WCC) were without junior guard Bryce Pressley (concussion) and have lost senior center Riley Barker for the season with a knee injury suffered Thursday versus Santa Clara. Thomas van der Mars added 12 points and eight rebounds, while sophomore point guard Alec Wintering had 12 points and eight assists for the Pilots. Freshman D’Marques Tyson came off the bench to drill four three-pointers as well. Bailey, who missed eight games with a foot injury before returning to the lineup on Thursday, also added five rebounds and four assists. The Dons (8-10, 2-4), who came into the game as the third worst free throw shooting team in the nation, finished 28-for-32 at the foul line, while the Pilots were just 17-of-25 overall. San Francisco led for most of the contest and used an 11-0 run early in the second half to grab a double-digit lead. Senior forward Kruize Pinkins hit two of his four three-pointers during the run. The margin grew to 17 points on a jumper from Mark Tollefsen with 8:31 left, but the Pilots were able to cut the deficit to seven in the final minutes. The Dons continued to convert at the free throw line to keep the game out of reach. Pinkins finished with 18 points, while Tollefsen and Tim Derksen added 15 apiece for the Dons. Portland freshmen Jason Todd, Gabe Taylor and Tyson provided a boost off the bench. Tyson finished with 12 points, Taylor had eight points, and Todd added seven points and five rebounds. The Pilots shot 50 percent from the field, but were just 6-of-18 from three-point range. USF also held a slight rebounding advantage, 30-29. Portland will now hit the road for a pair of games in Southern California. The Pilots take on Loyola Marymount on Thursday at 7 p.m. and then Pepperdine on Saturday at 5 p.m. Thursday’s game will be live on TheW.tv, while Saturday’s game is televised on Time Warner Cable SportsNet. Radio coverage for both games begin 30 minutes prior to tip-off on Sports 910 (KMTT). 2-2 2; HOFFMANN, Gavin 0-0 0-0 0. Totals 25-53 28-32 89. SHARP, Bobby 0-6 0-0 0. Totals 27-54 17-25 77. Tough loss for the team today. I really dislike losing to USF. The last two years at home were especially hard to digest, and I was really hoping we would turn the tide. Not to be as the Dons were tough on both sides of the court. Their defense put pressure on Wintering and he never got going, and as this year has shown as Alec goes the team goes. Thomas and Gabe are shooting a great percentage, why dont we use a few more shot attempts from them? As I was always coached, if you are shooting 80% then you arent shooting enough. Not having Riley really hurt today. His paint defense and the offense he has been showing were missed today. I think Rileys' absence will be felt the rest of the season. Bryce also would have been a factor. As stated above, not having two of our players was an impact. I continue to like the way Todd plays, his confidence is showing with his shooting performance. He doesnt force anything and takes good attempts. I also liked Tysons attempts, he has a great touch and just needs more reps and confidence. Bobby is due for a big game and the sooner the better. Kevin looked good today, he is starting to have some confidence in his game. He forced a couple tonight but a few of those went down the last two years. His assist to Gabe was a good find. The team has always played well when they could penetrate and dish. Bad day to go cold, notice I didnt say flat. Going 6-18 from three didnt help. I think if Bobby hit a couple and Alec getting a couple looks the Pilots dont get down by 15 and have to play catch up the whole game. We were trading 2's for 3's and couldnt get the stops/rebounds when needed. Pinkins and Mark went 7-13 and the rest of the team minus Glover shot 50%. We have a great opportunity to take two on the road next week. LMU and Pepperdine are both games we could win. Pepperdine will be the tougher of the two but if we can contain Davis I like our chances. Going 2-0 next week would be a great way to prepare for Pacific and St Marys. 1) USF consistently double-teamed the PG on screens at the top of the key. UP never adjusted to this, even after halftime. 2) USF drove the baseline from the corner multiple times. UP's defenders were never corrected to cut this off. 3) UP's defenders were consistently unable to get out and challenge USF's three-point shooters. And, as pilotdad mentioned, the Pilots did not play their hot hands, Taylor and van der Mars. Nor did they find ways to get Wintering loose for good shots. In-game coaching continues to be a weakness for the Pilots' program, nine years into Reveno's tenure. Before the game started, I thought to myself, "I really hope I don't have to read after the game how the Pilots were shorthanded, as an excuse for yet another home loss to USF." At least USF flat out won this one instead of hitting some stupid off-balance three at the buzzer. Credit to them, get over it, move on, and get better. USF played well, I will definitely give them that. It is a disappointing loss. Many seem to bang on Rex Walters but bottom line is he is a good coach. He outcoaches Reveno every year. Churns through his roster and brings in more JC's but still wins. I like the way UP has built their program but in this year, they should not be losing this game. While we may have varying opinions on Walter's methods (I can't stand him), its hard to deny that he is out-recruiting Reveno and others in the WCC. PilotNut wrote: While we may have varying opinions on Walter's methods (I can't stand him), its hard to deny that he is out-recruiting Reveno and others in the WCC. Totally disagree he's out-recruiting Reveno....but I will agree his players are a tough match up for UP and Walters' is a terrific coach. It would be pointless to argue the pros and cons of each recruit in this forum....probably with a program in one hand and beer in the other would be the best forum...but I can say that last year Walters did get one very huge contributor that was not eligible to enroll in a number of WCC schools...including UP. To say USF's recruits are better than UP's, is not backed-up by the facts. To say that USF has beaten UP in Portland for five straight years is borne out by the facts......so yeah, it could be Walters is a terrific coach! I based my comment on the fact that while Walters runs players out of the program at a high rate, he finds a number of "replacement" players that have talent... He has to recruit twice as many players, and while there may be all sorts of questions, he does find talent. I suppose it is apples & oranges--2 different types of student-athletes. (I certianly don't endorse his methods, nor do I think they are sustainable in the medium to long term). I am too lazy to look right now, but I have to assume USF's APR will be negatively effected? Well, academically it's rotten apples to Oranges. 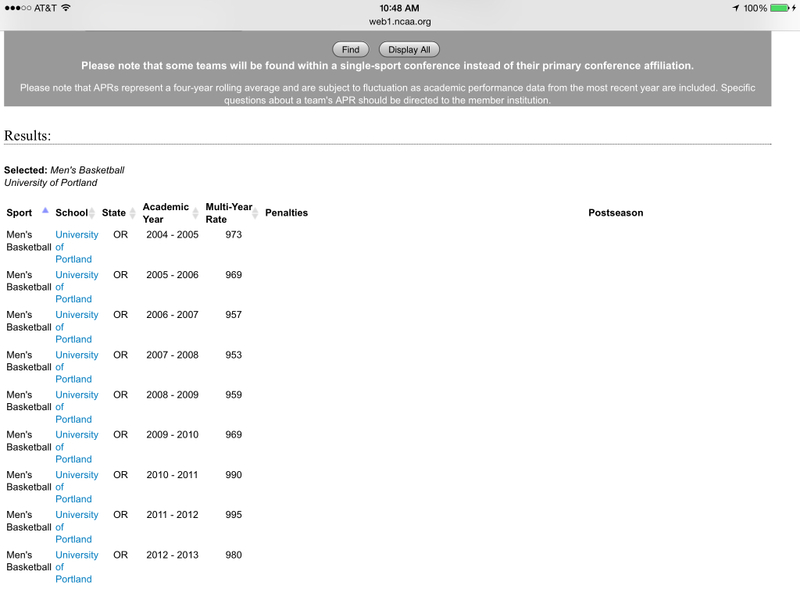 Here is USF's APR for the last 9 years. Keep in mind that the current NCAA guidelines say a team should be at a reduced scholarship level or suspended from postseason play if it's APR is below 925. Under those guidelines, USF makes it only 3 years. And in that span except for one year, USF's best APR is less than UP's worst four year average. Anything under that is considered to be a less than 50% graduation rate. 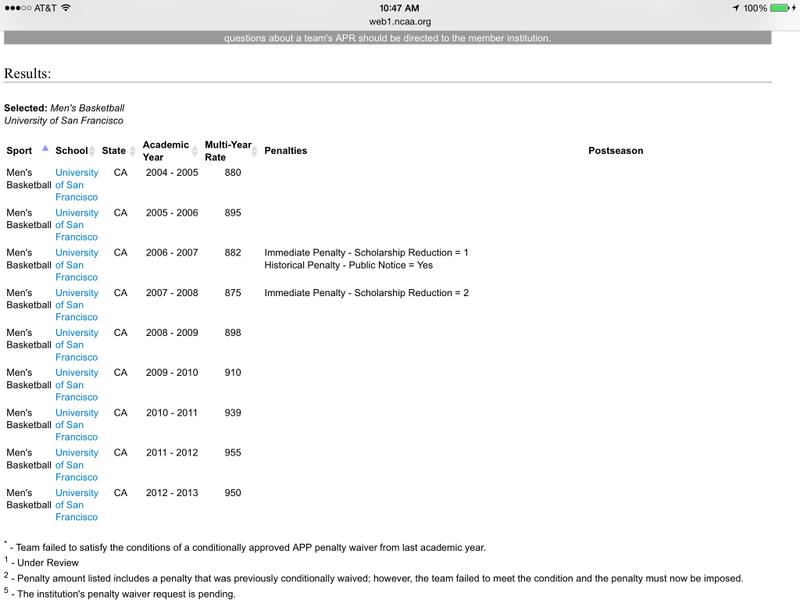 Even under the old guideline USF had two penalty years and should have had five. Surprisingly , their last 3 years are acceptable, even with all the changes. You have to credit Rex for improving things. This measures individual years, rather than four year averages each year. Single year anomalies are no big deal as long as the 3 years around it compensate. In that respect you have to credit Rex.